Throughout the past five years or so, high-rise dining has become increasingly popular within the city. And it’s certainly unsurprising given the erection of so many monolithic new landmarks now piercing the sky, and towering over the iconic structures of yesteryear enticing with their Metropolis 21st century constructions, lifts (not elevators) that seem as though installed by NASA, and most of all: the sweeping panoramic views across our fair city. With many of these such restaurants, the physical location is often used as the only redeeming quality, with the chefs and restaurateurs allowing the view to mask the often cack-handed cooking that’s on offer for the most outrageously exorbitant prices. With many of these restaurants, potential visitors would be far better off for booking the next budget airline flight to New York: generally offering better value, better views on departure and arrival, and – dare I say – better food. This is not the case for all high-rise restaurants, nonetheless. Some use their iconic locations act purely as a base to serve some of the finest food that the city has to offer. The views, in accordance, become a pleasing albeit unnecessary addition. In 1996, long before ‘The Shard’, ‘Gherkin’, ‘Walkie Talkie’, and Heron Tower were even built, Harvey Nichols opened their first standalone restaurant within the iconic OXO Tower. Perched upon the Southbank between both Southwark and Waterloo Bridge, the building was initially built as a power station, but became famous for it’s stained glass windows as a revolutionary means of advertising for OXO – the stock cube company – that operated from the site during the 1930s, during which time there was an official advertising ban. Located upon the eighth floor, just beneath the famous central tower, the restaurant is decorated with a stylish subtlety that allows the floor-to-ceiling windows to act as the main internal feature. Unfortunately, during our early dinner visit, the lighting was so bright that the only real view through the windows was a reflection of our wind-burnt faces staring back at us, juxtaposed to the nearby St. Pauls Cathedral or any of the aforementioned new skyscrapers peering down upon us. A shame given that lower-lighting, or a daytime visit, would have made our window side table one of the best places to be in London at any given time. Run by Head Chef Jeremy Bloor since 2001, there’s a strong focus on using the best of British ingredients in the kitchen here, all in order to create a range of seasonally inspired dishes. To begin, a plate of neatly assembled slivers of perfectly pink cured duck was accompanied by a snaking contour of smooth artichoke puree, topped with a smattering of hazelnuts to bring a new depth of texture to the dish. Then unable to decide between a wide selection, a dish of shredded white crab meat atop an elliptical disc of gently toasted brioche and smothered in sweet zabaglione was suggested. Boasting an intriguing blend of sweetness from the bread and topping, combined with the salty savoury element of crab to make a remarkably balanced plate of food. Next, a venison Wellington for two to share was a striking example of seasonality at its best. Favouring lean, gamey venison instead of the more traditional beef, the cherubic parcel arrived on an old fashioned serving trolley before being carved into two generous slices each, accompanied by buttered poignant kale. Again, the meat was impeccably cooked, served medium-rare, working beautifully alongside a cushion of mushroom duxelle and rich chicken liver parfait. While beef Wellington is a personal all-time favourite – this version of the dish is the closest to perfection that I’ve tasted in quite some time. As is often the case with restaurants located within London’s most prestigious buildings, prices are almost as high as the geographical altitude. 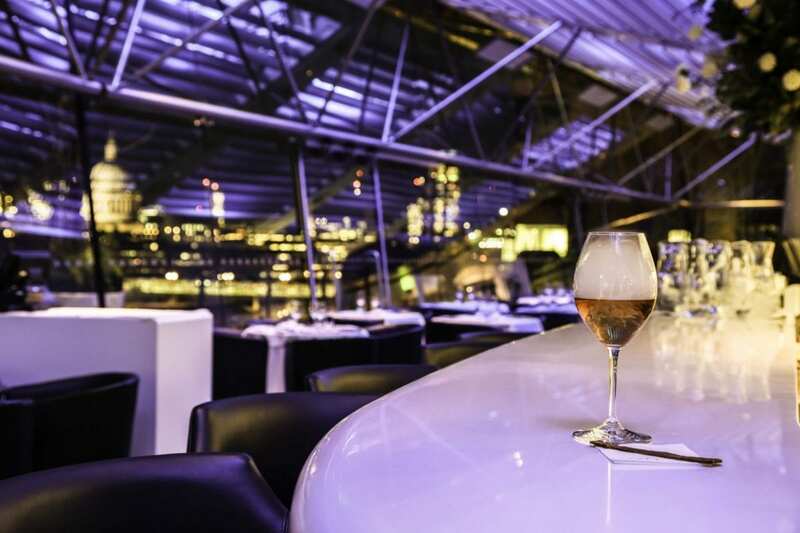 Nonetheless, the overall experience at the restaurant within the OXO Tower does fall into the more pleasing category of towering dining spots within the city. The OXO Tower Restaurant can be found on the 8th floor, OXO Tower Wharf, Bargehouse Street, London, SE1 9PH.